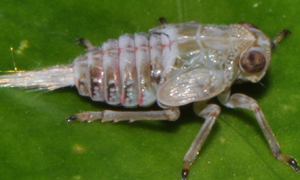 The Issus is a plant-hopping insect living in gardens all across Europe (Fig.1). Now, scientists found they have in their legs gear mechanisms previously thought to be man-made and used on every bicycle and car gear-box. Their discoverers from the University of Cambridge said that this is the “first observation of mechanical gearing in a biological structure”, and published their findings in the journal Science. As it is clearly seen on Fig.2, the gear teeth on the opposing hind-legs lock together. The legs move within 30 microsecond of each other, securing complete synchronicity in leg movement, otherwise would result in “yaw rotation” and putting the insect spinning out of control. 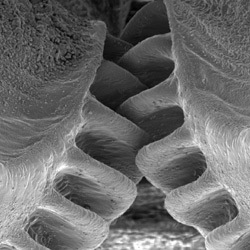 It is hard to understand how random mutation could provide the Issus with a so complex and perfect mechanism, but the authors said: “These gears are not designed; they are evolved – representing high-speed and precision machinery evolved for synchronisation in the animal world.” It is worth to mention that the mechanistic gears are only found in the insect’s juvenile – or ‘nymph’ – stages; they are lost in adulthood. The authors apparently suggest that the risk of breaking one tooth on the gear due to systematic use (entropy!) may be the reason why nature prefers another solution. Fig. 1 – The Issus. Image credit: Cambridge University.